When Lindsay from Craft Buds asked if I would participate in Craft Book Month, I jumped at the chance, especially after she said I could pick a project from any craft book. If there is anything I own in abundance (besides fabric, of course...), it is craft books! I knew right away the one book I would choose is Sunday Morning Quilts, co-written by my friends, Amanda Jean Nyberg and Cheryl Arkinson. I had done a review of this book nearly as soon as I received it back in March. And might have mentioned how I nearly screamed out loud was thrilled to see my blog mentioned in the book! Have I mentioned that I have stayed at Amanda Jean's house? Probably so. It is always a highlight so spend time in her sewing room (although this is now outdated as she has moved her sewing room to another part of the house). And to sleep under one of her quilts. And to dry my feet on this fabulous little rug by the shower. Oh, and we chopped rhubarb and had homemade rhubarb crisp, warm out of the oven. Yum. Ahem. Back to the book. I chose to make one of Amanda Jean's fabulous quilted storage boxes.With a little twist. While I love the rainbow of boxes (and I really do plan on making my own rainbow of these boxes), I started with a pile of selvages. I sewed them together on a piece of muslin used as a foundation. To keep them nice and straight, I drew lines about every inch of so. If you are using scraps, not selvages, you can sew horizontally and vertically as your build your slab of fabric. I tried that with selvages. Doesn't work so well. Because you are sewing selvages to a foundation, you end up with raw edges. But rather than un-sew them, I just sewed over them. It really didn't even matter. Sweet. I had some Malka Dubrawsky selvages that were short, rather than a long strip. So I just sewed them all together before I added them to the slab. Here are the completed sides. Amanda Jean recommends adding some lightweight cardboard (think about recycling your cereal boxes) between the lining and the outside fabric to give the box some added stability. But I found that because the selvages are a little sturdier, this wasn't really necessary. The lining is from Violet Craft's Peacock Alley line of fabric. So cute. My completed box. I LOVE it! I love this book so much. Amanda Jean and Cheryl have done an outstanding job of giving steps to get your scraps organized and turn them into beautiful quilts. There are lots of books out there giving us great ideas for turning beautiful fabric into quilts and other projects. But no matter what you make, you end up with little bits, and sometimes larger bits, of fabric. This book is a great addition to any craft book library. ETA: My good friend, Stephanie, just posted a review of this book, including a giveaway. Don't miss it! Thanks for stopping by. Here is a list of the bloggers on the hop. Now it's your turn. Make a project and then link it at Craft Buds from Sept 23-30 from your blog or Flickr account, and enter to win prizes. Winners will be announced on Monday, October 1! I love how your box turned out! I need to make some of these. I think making a box like that out of selvages to store my selvages in would be fun. I need something to store selvages in, and I haven't used any selvages yet. Thanks, Cindy! I love it! I agree with you 100 percent! 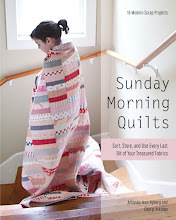 Sunday Morning Quilts is such a wonderful, inspirational book! Loved your behind the scenes peek and your selvage project is wonderful!! This seems like a wonderful book. I will have to see if the library has it. Thanks for the inspirtation. I love the use of your selvages. such a cute project. Great little box Cindy. I think I'll do the same as Stephanie and make one like yours for holding selveges! How fun to get to participate in this blog hop! Don't you love making these storage boxes? They are so handy to have around. I love your selvage version, which is perfectly your style! I love that storage box. I have a couple of bags of selvages and have only used them to make a couple of pincushions. I'm thinking I need to make something bigger and these boxes look great. And I'm thinking they would make great Christmas gifts! I always need something for my Mom. Love that box! I think I will go make one! I love your box and definitely see more in your future!! What fun - love your selvage box and your 'perhaps I should make a couple more boxes' hehe. gorgeous little box! I think I might beat you on the craft book front, I have an obscene amount! Cheryl was at my guild meeting last night. What a pleasure to meet her! I bought two of her books. I'll be giving one away around the last week of September. I'm so excited to read more in the books. I just love this book, and each time I see it I want it more. You have a great blog. I love your tips and techniques and the little box is just wonderful. Thanks for a chance to win. Aw, Cindy. Such kind words. And I love that you describe a visit to Amanda's so well. I had all those same thrills! well, except we made tortillas instead of crisp. Love your selvage container. Well done. Are you finding lots of sewing time these days? Hope you'll stop by and enter my giveaway. That selvage container is absolutely ingenious. I love it and since imitation is the sincerest form of flattery, I may have to start one myself ASAP. I hope you don't mind! A gorgeous box made out of selvage. I'm glad I didn't throw mine away. Being a newbie I knew it could be used to create something very charming and very useful :-). I wish I had so many books like you :-) Great box! Fabulous job on the box. I have yet to make one ; ) is it difficult? Seriously. Do you ever sleep? I love your selvage box and how fun it must have been to make a tiny dent in your collection--don't you feel positively wonderful about that? Such a darling box--I'd be filling it with stuff just to play with it. Need some more selvages? ?